I can't help but think of those Walgreens commercials telling the story of the fictional town of 'Perfect' when trying to describe Rosemary Beach. If you can get past the stuffiness of the community's highbrow persona and the carefully-structured nature of the community's grand design then it really is an exquisite experience. It's no wonder Hollywood chose nearby Seaside (a similar community) to serve as the backdrop for The Truman Show. It epitomizes what a lot of people would idealize about a village by the sea. This was our third trip to the area. Our first visit was back in 2002 when Holly and I stayed at Fishstix, one of the lavish, full-size houses in Rosemary Beach. Ordinarily, we'd never look for such a massive place for just the two of us. But it was a gift for helping out with the owner's website so who am I to turn down a $400+/night place! The Buffett song 'Gypsies in the Palace' nicely summarizes how I felt on that trip. On our second trip last year, out entire family joined us for a stay at the neighboring Seacrest community. We were even able to bring Tucker this time. We got a really nice big house with an excellent view (which is rare in the 30A area) and had a great time. Adam still talks fondly about his tower room. But on this trip Holly and I wanted the chance for something a little more romantic. We had seen the carriage houses in Rosemary Beach and thought they'd be perfect for our needs. And they definitely lived up to our high expectations. If I were a young couple looking for a 'local' or 'affordable' honeymoon destination I'd definitely give the carriage houses some serious consideration. 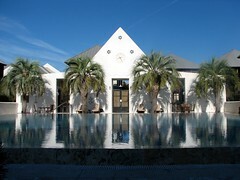 It gives you a great chance to enjoy the luxurious surroundings of Rosemary Beach without the over-the-top costs. We'll definitely be visiting the area again sometime soon.